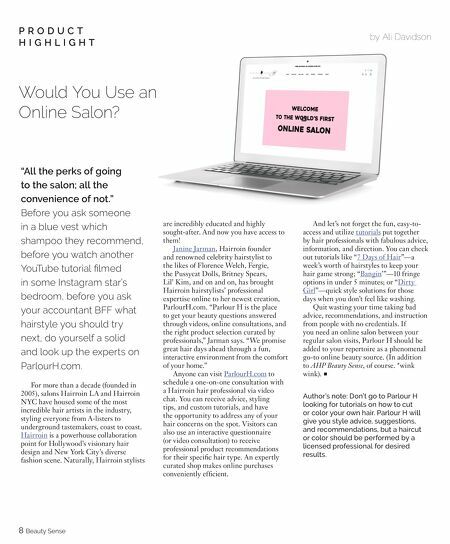 Would You Use an Online Salon? "All the perks of going to the salon; all the convenience of not." Before you ask someone in a blue vest which shampoo they recommend, before you watch another YouTube tutorial filmed in some Instagram star's bedroom, before you ask your accountant BFF what hairstyle you should try next, do yourself a solid and look up the experts on ParlourH.com. For more than a decade (founded in 2005), salons Hairroin LA and Hairroin NYC have housed some of the most incredible hair artists in the industry, styling everyone from A-listers to underground tastemakers, coast to coast. Hairroin is a powerhouse collaboration point for Hollywood's visionary hair design and New York City's diverse fashion scene. Naturally, Hairroin stylists 8 Beauty Sense P R O D U C T H I G H L I G H T by Ali Davidson are incredibly educated and highly sought-after. And now you have access to them! Janine Jarman, Hairroin founder and renowned celebrity hairstylist to the likes of Florence Welch, Fergie, the Pussycat Dolls, Britney Spears, Lil' Kim, and on and on, has brought Hairroin hairstylists' professional expertise online to her newest creation, ParlourH.com. "Parlour H is the place to get your beauty questions answered through videos, online consultations, and the right product selection curated by professionals," Jarman says. "We promise great hair days ahead through a fun, interactive environment from the comfort of your home." 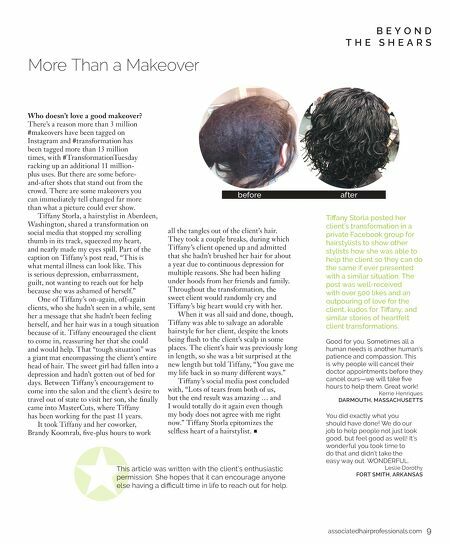 Anyone can visit ParlourH.com to schedule a one-on-one consultation with a Hairroin hair professional via video chat. You can receive advice, styling tips, and custom tutorials, and have the opportunity to address any of your hair concerns on the spot. Visitors can also use an interactive questionnaire (or video consultation) to receive professional product recommendations for their specific hair type. An expertly curated shop makes online purchases conveniently efficient. And let's not forget the fun, easy-to- access and utilize tutorials put together by hair professionals with fabulous advice, information, and direction. You can check out tutorials like "7 Days of Hair"—a week's worth of hairstyles to keep your hair game strong; "Bangin'"—10 fringe options in under 5 minutes; or "Dirty Girl"—quick style solutions for those days when you don't feel like washing. Quit wasting your time taking bad advice, recommendations, and instruction from people with no credentials. If you need an online salon between your regular salon visits, Parlour H should be added to your repertoire as a phenomenal go-to online beauty source. (In addition to AHP Beauty Sense, of course. *wink wink). ■ Author's note: Don't go to Parlour H looking for tutorials on how to cut or color your own hair. Parlour H will give you style advice, suggestions, and recommendations, but a haircut or color should be performed by a licensed professional for desired results. Quiz:Are you getting the most ou tof your hair appointments?